When I was growing up, both my parents worked full time. While they worked a lot, without cellphones or laptops they didn't bring her work home with them in the same way we do today. Their work and their lives existed in two separate spheres. Back then it was possible to think about the concept of work-life balance. Today, technology has blended everything together. Where it used to be work and life, now it's all just life. I often call this the "work-life mashup." It's imperative then that the companies we work for and lead develop values, culture and policies that support the full lives of employees. It's not only the right thing to do, it's also good for business. Many studies conducted over the past decade have establish clear evidence that people are more productive and creative when they are happy and fulfilled at work. Research from Teresa Amabile at Harvard Business School, suggests that "if happier on a given day, people were not only more likely to come up with a new idea or solve a complex problem that same day but also to do so the next day." Happiness also boosts performance and therefore also business outcomes -- between 1998 and 2005, the stock prices of Fortune's "Best Places to Work" increased an average of 14% vs. 6% for the market overall. And fulfilled, happy employees save costs as well. Gallup reported in 2010 that lost productivity due to employee disengagement and dissatisfaction costs over $300 billion per year in the U.S. The first companies to build cultures and policies that support the full lives of employees, driving higher employee satisfaction, will be the most successful. They will attract and retain the most talented employees, have the most loyal customers, and build the strongest brands. As business leaders, we need to ask ourselves how we can build work environments that support the full lives of the people we work with. Here are 3 steps you can take in that direction: 1) understand what motivates people, 2) build policies that support people's full lives, and 3) model the possibilities. As a coxswain on my college rowing team, I had to understand what motivated the whole crew and what motivated each individual. My job was to get the team rowing perfectly in sync and at their maximum capacity, which meant I had to be able to give constructive feedback to the whole boat, and also to each person as an individual, in real time, and in front of their peers. This experience taught me clearly that different people are motivated by different factors. I brought this lesson into an office setting by creating a tool I call the "motivational pie chart." Rather than trying to guess what members of my team cared about, I started asking people what matters to them. People define the categories that motivate them (recognition, compensation, meaningful work, learning new things, etc. ), then they assign each category a percentage weighting according to its level of importance, and finally they assign a "red, yellow, green" color coding system to rate their current satisfaction with each category. 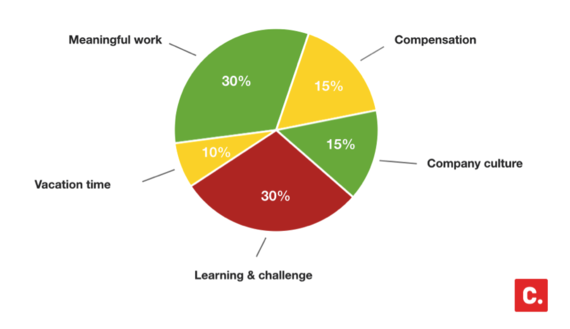 After using this tool with teams over the past 15 years, I've found that: 1) compensation is like the bottom of Maslow's hierarchy of needs, once people feel like they are paid enough, it tends to become a small portion of the pie, but until then it's quite important to people, 2) there is a lot of variation in what motivates people and also a lot of common factors that people share, and 3) meaningful work is a critical component for nearly everyone. We cannot underestimate the power of purpose. Knowing exactly what each individual values will help keep each person motivated and productive at work. And knowing what matters most to many people will help guide policy development. As an example of the kind of policy that recognizes the full lives of employees, at Change.org we recently changed our parental leave policy to give all parents 18 weeks of fully-paid, flexible leave that can be taken any time during a child's first year. As a global company we knew that policies for parental leave are much more favorable outside the U.S and we wanted to reduce that disparity to treat all our employees equally. We also wanted a plan that would recognize the evolving nature of families -- from fathers who want to play a more active role to the increasing number of adoptive and LGBT parents. And, we believe that providing equal leave for men and women will help reduce the stereotypes that lead to gender inequality in the workplace. Finally, we did a robust financial analysis and believe that a strong parental leave policy is, in fact, good for business. With generous, paid parental leave, employees are less stressed and more productive when they come back to work, and a strong paid leave policy is both an advantage in a competitive hiring environment and an effective retention tool. Policies like this one that recognize and support people's lives can go a long way in helping employees feel appreciated and understood, and therefore happier and more productive at work. Instituting the policies is not enough. If people don't see their leaders modeling these behaviors, they won't feel comfortable doing it either. Take vacation time as an example: there is an "unlimited vacation" trend among many companies in Silicon Valley, but as generous as it sounds, in many of the companies with this policy no one knows how much vacation is really appropriate to take so people often end up taking less, and feeling guilty if they take too much. Instead, we decided to offer employees 5 full weeks of vacation, no matter where they are in the world. (This is standard in some countries, like many in Europe, and very generous in other places, like the U.S.) And, while it's sometimes hard to separate myself from work, I really push myself to take these five weeks (or close to it) every year, so people know that is what we really want them to do. When we ask people to really commit to their work, it's also important to give them the time to recharge. While Change.org is explicitly a social enterprise in our mission and our products -- we have 90 million users in 196 countries winning campaigns for change nearly every hour -- the world as a whole is shifting and the very face of business is changing. As more businesses build policies that focus on the full lives and interests of individuals, we are moving towards the reality that all companies will be social good companies in the way they interact with their employees in this technology-driven, mashed up world. The WorldPost is hosting a Future of Work conference on March 5th and 6th in London. To find more information, visit The WorldPost conference web site.